Early in 1840 a committee of Liverpool ladies, concerned for the welfare of numbers of destitute orphan girls in the town, issued a prospectus in which they appealed for public support for the setting up of a girls’ orphan asylum. Led by Mrs James Aikin, born Anne Elizabeth Harrison and daughter of a British Army officer, and who had married Liverpool merchant and shipowner James Aikin, they secured the practical support of a sympathetic accountant, Harmood Banner. Their appeal resulted in a meeting of contributors and subscribers in the Royal Institution on 5 May 1840, chaired by the Mayor, Joshua Walmsley. 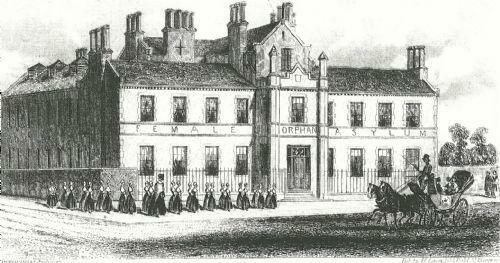 It was resolved that The Liverpool Female Orphan Asylum would be ‘of great value and utility’. The children would be ‘brought up in the principles of the Established Church’ and be educated in a ‘suitable manner to fit them for domestic service and be apprenticed as household servants in the families of Guardians of the Institution or other respectable private families’. The new asylum would provide support ‘for the town of Liverpool and the neighbourhood’ rather than just for the parish of Liverpool. A house was taken at 97 Upper Stanhope Street; and in August 1840 the first orphan, 10-year-old Mary Cearns, was admitted. Within a couple of years, with 40 girls in residence, the house was described as being ‘full to overflowing’. The Mayor, now Robertson Gladstone, laid the foundation stone of a new building in Myrtle Street offering more permanent accommodation for up to 150 girls, and on its opening in November 1843, 48 children were transferred from Upper Stanhope Street. Mrs Aikin died in July 1849 at the age of 55, but the work she had started was to continue with the support of a substantial group of benefactors. Portraits of both Mrs Aikin and Mr Banner had been placed in the board room at Myrtle Street in 1846 – and are still in the possession of the Trustees. In April 1850 a small asylum for boys was established in a rented house at 21 Hope Street to which 22 boys were admitted, but to meet the need for larger premises equivalent to those provided for the orphan girls the foundation stone for a boys’ asylum near to the girls’ asylum in Myrtle Street was laid by the Mayor, now Thomas Littledale, in October 1852, and 52 boys left Hope Street in March 1854. Having brought not only his business experience but also a philanthropic involvement in the setting up of the orphanages, Harmood Banner took personal responsibility for building at his own expense a church on the site between the two Myrtle Street buildings – the Church of the Holy Innocents. The foundation stone was laid by the Lord Bishop of Chester on the same day as the laying of the foundation stone for the boys’ asylum, and the church opened in 1854. The children admitted had to be full orphans, of legitimate birth, live within seven miles of Liverpool Exchange, be healthy, be baptised in the Church of England and have no means of support other than workhouses. Originally from age 8 and not more than 10, this was later changed to from age 7 to not more than 11. However, a need was in due course recognised for the admission of younger children and this was met by the temporary establishment in 1858 of an infants’ orphan asylum at Windsor Terrace, 274 Upper Parliament Street (between Crown Street and Embleton Street). 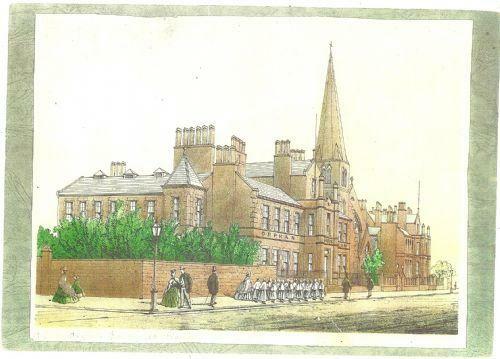 In March of the following year Harmood Banner laid the foundation stone of a new infants’ asylum near to the Myrtle Street orphanages, in Melville Place. In 1913 it was decided that the three asylums should be united and the name The Liverpool Orphan Asylum adopted, becoming The Liverpool Orphange in 1925. The three governing bodies became one. Times were changing and the Myrtle Street site became less suitable. It was decided to move to another site, and an open site on the Salisbury estate at Woolton Road, Childwall, became available. The Great Fair in 1930 raised the additional funds required to meet the cost of the new buildings and an architectural competition was held. In 1934, after earlier in the afternoon he had opened Sir Alan Cobham’s aviation display at Speke, on 21 July the Lord Mayor, Councillor Strong, opened the new orphanage. The band of the Grenadier Guards provided a musical programme, and the opening was followed by a pageant staged by the children. It was for the city the end of a hectic week, in which both the Queensway Tunnel and the East Lancashire Road had been opened by His Majesty King George V.
The Corporation acquired the old orphanage sites and additional adjacent land, and in November 1934 a contract was let for the construction of Myrtle Gardens, with the first occupation in April 1936. Two-thirds of the original structure, now renamed Minster Court, remains to represent part of Liverpool’s 1930s housing heritage. An adjacent street carries the name Orphan Street as a reminder of the history of the site. The communion plate from the demolished Church of the Holy Innocents remains in the possession of the Trustees. In 1940 the children were evacuated to the Lake District, the girls to Wanlass How at Ambleside and the boys to Hawse End in Keswick. They returned in 1952. The Woolton Road building had meanwhile been requisitioned as a military convalescent hospital for the duration of the war, and derequisitioning took some time. The Orphanage had previously been a place where children both lived and received their education. 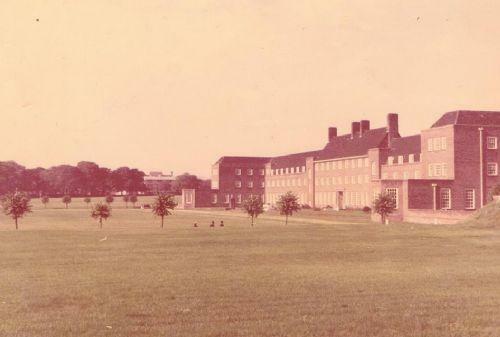 On 8 June 1953 a Scheme was entered into by the Trustees under an arrangement whereby a voluntary aided school would occupy certain areas of the premises with the orphans remaining in occupation of the living accommodation. Childwall Church of England Primary School was established to continue the Church of England identification with the Orphanage rules and regulations. The school was open to children of the locality as day pupils. In 1958 the name of the Liverpool Orphanage was changed to Salisbury House. By 1962 changes in social structure with regard to orphans had changed and the Trustees found themselves with a building occupied by very few orphans. A Scheme dated 11 September 1964 under the Charity Act 1960 established the provision of a boarding facility for boys and girls, preferably from the Liverpool district, from the age of 7 years. In fact boarders from Liverpool were few enough in number for children from other areas to be enrolled. Many came from service families or where parents worked overseas and wished their children to receive an education in Britain. Locally, the school was held in high regard and both boarders and day pupils, together with the orphans remaining, benefited from the arrangement and the education available. Again, changes were being experienced in that children were either going overseas with parents or one parent was remaining in Britain and so kept their children at home. The boarding activity virtually ceased and with the reduced income the Trustees had no option but to close the facility. The day school continued to operate on the ground floor of the building and considerable effort was made to find a suitable tenant for the first and second floors but without success. The building was becoming impossible to maintain and reluctantly the Trustees decided to sell a portion of the site for housing and with the proceeds to build a new school on the retained area. The local authority at the time reduced the capacity of the school to 240 children with an additional 40 places for a nursery. At the time the school had over 300 pupils in the junior and infant departments. The building was partly financed by Department for Education grants and opened in 1988. In 2008 approval was given to give the school two-form entry status. Extensions to the building have been made to give proper effect to the increase in the number of children attending. A new Scheme was approved and established under the Charity Commissioners for England and Wales and sealed on 21 October 1998 whereby 37 trust funds identifiable as endowment funds were merged into a single Endowment Fund. The investments appropriate thereto were invested in the Charities Official Investment Funds. Opportunity was taken to consolidate under a separate Scheme certain funds under three headings that were relevant to Education, Awards and Prizes, and Religious Activity (known as the Chapel Fund). In addition a fund for the replacement of the building or major building works was set up. The historic funds were supplemented by other General Funds of the Trustees to give added value to the new funds. Consequent upon these two Schemes being effected, the Trustees introduced an operating structure that gave involvement for all the Trustees either as foundation governors of Childwall Church of England Primary School or as members of committees managing the Education, Awards and Prizes or Chapel Funds. A standing committee of certain Trustees who provide specialist advice was also formed. The management of the Childwall Church of England Primary School is through a board of governors who are responsible for admitting children to the school in accordance with a published admissions policy, which also recognises the desire of the Trustees, having in mind the historic nature of the institution, to give appropriate consideration to children who have lost either or both parents by death. The Trustees of Salisbury House provide the larger proportion of governors in accordance with the statutory regulations relating to Instruments of Governorship. A different perspective: This photograph was very kindly emailed to us by Phil Essam, a former boarding pupil of the school in the 1960s. It shows the school from the East wing, looking towards Taggart Avenue. It gives an idea of the scale of the site - this photo was probably taken from what is now the housing development of Salisbury Park. A news report from the Liverpool Mercury on 3rd November 1843, describing the opening of the "Female Orphan Asylum", including a mention of the presentation of the painting showed earlier in this article.